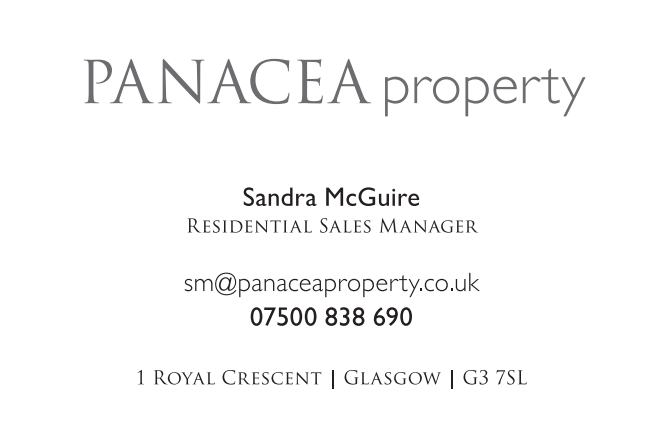 We are delighted to announce that the hugely popular Sandra McGuire has joined our PANACEA team as Residential Sales Manager. Sandra has been highly recommended by industry colleagues and will oversee all our sales for our existing and new projects. She brings a wealth of knowledge and experience having worked very successfully either directly or indirectly as a sales agent with most of the main developers across central Scotland including key roles such as – Regional Sales Manager for Scotland Land and New Homes, Allen and Harris, Sales Director for Scotland Land and New Homes, Slater Hogg and Howison, and Regional Sales Manager for the North of England and Scotland, Countrywide group. Sandra has also worked at senior management level for Bryant Homes, Westpoint Homes, Miller Homes, CCG Group to name but a few. We welcome Sandra into the team and look forward to sharing exciting times ahead as we continue to build PANACEA property.